“Should old buildings look old? Or should they be restored to a condition where they look as if they could have been put up yesterday? Those questions are raised in a particularly pertinent form by the work going on at one of the most beautiful and inspiring of all old buildings: Chartres cathedral in France. “Most of Chartres cathedral dates from between 1194 and 1230, when the bulk of the colossal stone structure, with its nearly 200 stained-glass windows and thousands of sculptures, was built. 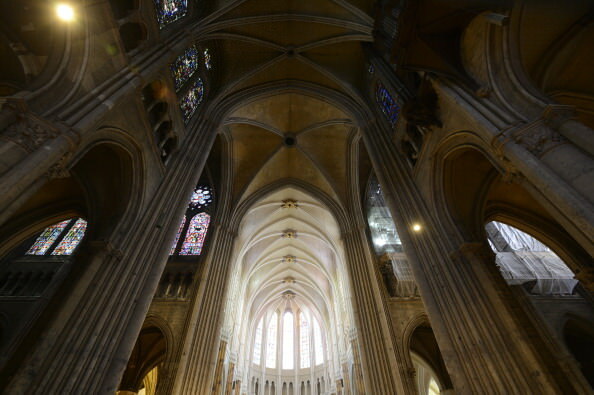 The extraordinary speed of its construction means that Chartres has an architectural and decorative unity that is unique among surviving cathedrals, most of which took a hundred years or more to complete, and were then altered drastically over the succeeding centuries. “Chartres has suffered from the inevitable indignities inflicted by time. The paint with which the medieval artists originally covered the statues and the walls faded and flaked off within a few generations. Centuries of burning wax candles covered the interior with a thick layer of black soot. But Chartres remains far closer to the original building than almost any other medieval cathedral. The biggest effect of the intervening centuries since 1230 has been the accretion of the patina of age. A sense of the passing of time is part of the experience of looking at Chartres. 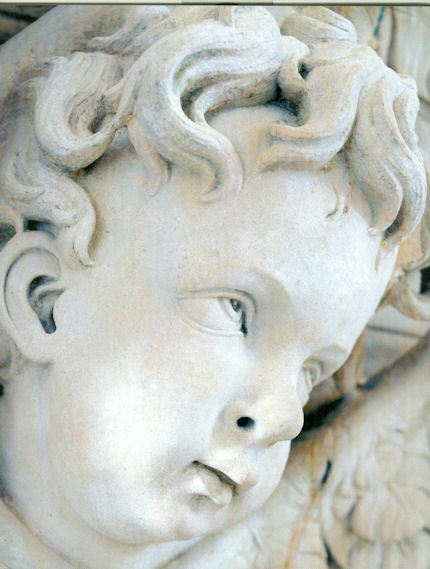 The stone, the glass, the sculpture — it all looks very old, and its age is part of its fascination and its mystery. “Or at least, it is in those parts of Chartres cathedral that have not yet been cleaned by the latest restoration project. It isn’t in those parts where the restorers have finished their work, for they look brand-new. There’s no patina of age here: there are only clean and bright surfaces. “In 2009, amid a rising wave of other refurbishments of medieval buildings, the French Ministry of Culture’s Monuments Historiques division embarked on a drastic, $18.5 million overhaul of the eight-hundred-year-old cathedral. Though little is specifically known about the church’s original appearance—despite small traces of pigment at many points throughout the interior stonework—the project’s leaders, apparently with the full support of the French state, have set out to do no less than repaint the entire interior in bright whites and garish colors that are intended to return the sanctuary to its medieval state. This sweeping program to ‘reclaim’ Chartres from its allegedly anachronistic gloom is supposed to be completed in 2017. Above, Fig. 2: left, Chartres cathedral stone work in its pre- and post-restoration conditions; right, the view looking SE in Chartres cathedral showing painted and unpainted areas adjacent to each other. Robin Simon gave the ninth annual ArtWatch International James Beck Memorial Lecture – “Never trust the teller trust the tale” – on 7 November 2017 at the Society of Antiquaries of London, in Burlington House, Piccadilly, London. 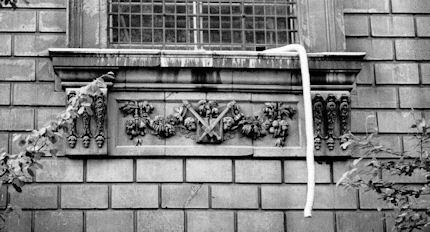 Alasdair Palmer has written frequently on art restoration for the Spectator and the Sunday Telegraph – see “Restoration tragedies” 26 August 2012. Martin Filler is a prominent American architecture critic and a fellow of the American Academy of Arts and Sciences. The various strongly made cases against the Chartres Cathedral restoration project, rest in essence on the folly of attempting to replicate a speculative incompletely-informed notion of how an interior might have appeared many centuries ago when brand new. At Chartres this particular exercise is not only wrong-headed, it is, as Alasdair Palmer pointed out five and a half years ago, especially egregious: this attempted replication of an original state is inflicting a peculiarly brutal and unforgivable expunging of an ancient building’s historically lived evolving appearance. “Brutal”, because having been uniquely executed as a distinct artistically integrated whole this cathedral’s precious fabric had thereafter survived in uniquely unmolested form. Here was a building whose monumental lucidity might be considered a match for the timeless Parthenon. Here was a building which, unlike the Parthenon today, had not become a cadaver on a test bed for aggressively invasive conservation methods; which retained its forms and, even, an especial ancient illumination – one that, as Robin Simon attests, had once “cast the most wonderful haunting blue light throughout what was a uniquely ethereal interior”. Gone. And all in exchange for an $18million building contract that is already running over schedule and will, no doubt, end over budget. 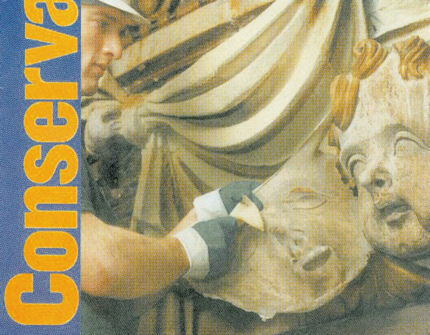 When faced with incomprehensibly barbaric mistreatments of old art and monuments we must ask not only “why?” but “who profits?” The last is no slur. It is a necessary step towards explanations for otherwise inexplicably perverse cultural actions. 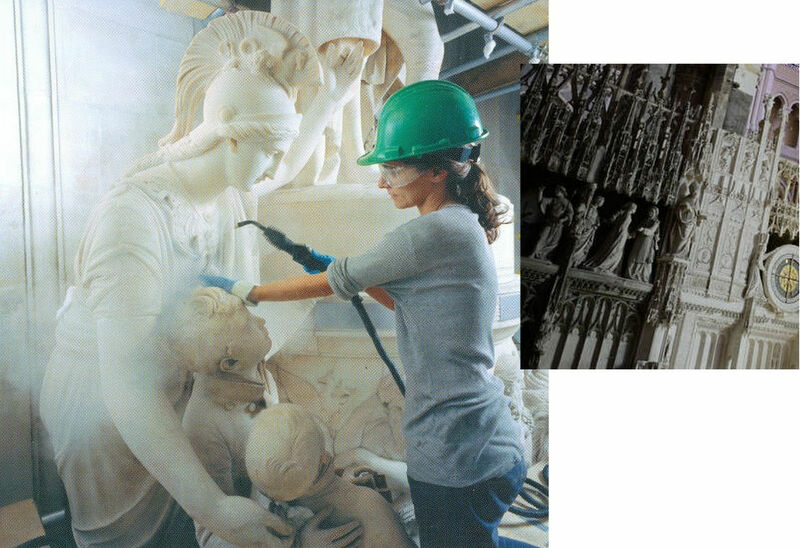 It is indisputably the case that such high-prestige art and architecture restorations generate much employment, purchases of materials, scaffolding etc. 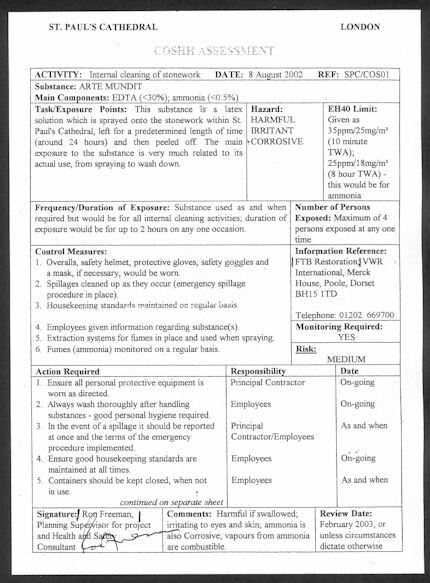 – and that they can greatly enhance professional reputations. None of those consequences is necessarily wrong or bad in itself but due acknowledgement of them should constitute a component part of any calculus of appraisal of restorations or proposed restoration campaigns. It is concerning that in today’s rapidly accelerating restoration boom, material/professional interests are looming ever-larger as it proves increasingly easy to raise funds for large-scale building projects made on the back of the culturally-loaded, ethically coercive, names of “conservation” and “restoration”. We know that the Chartres project has been part funded by the French Government. In this climate, greatly more vigilance and disclosure are now urgently required. No such project should ever be sprung on the world again. Monumentally dramatic proposals should be examined widely publicly and well in advance of the scaffolders moving in. Above, Fig. 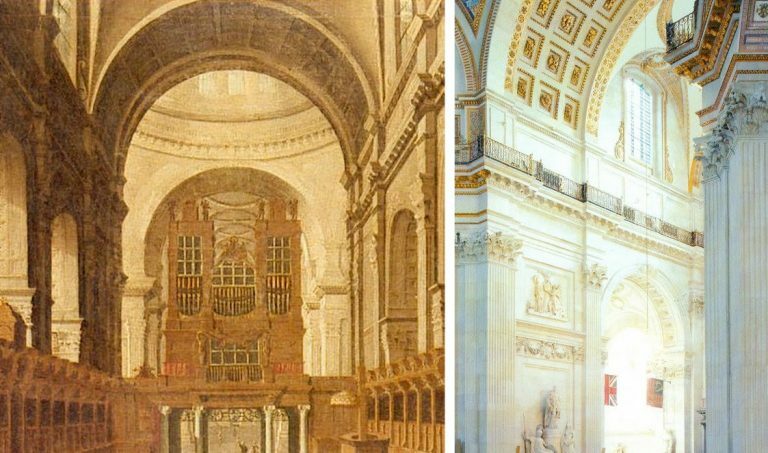 4: Left, the original interior of St Paul’s Cathedral as recorded in an undated but apparently 18th century painting that is owned by The Worshipful Company of Goldsmiths, at which date Sir Christopher Wren’s original painted finish comprised of three coats of warmly tinted oil paint that had been stipulated, according to Wren’s son, “not just for beautifying, but to preserve and harden the stone” still survived. It was only disclosed during the recent under-researched stripping of the interior of St. Paul’s that Wren’s oil painted surface had contained lead white, ochre and black pigments so as to produce precisely the warm “stone colour” found in other Wren churches. Above, right, we see the new dazzling white surfaces of the building’s interior and its sculptures when illuminated by one of new electric chandeliers installed during the restoration because, as Martin Stancliffe, the cathedral’s then 17th Surveyor to the Fabric, put it, “the heart of my vision for the interior [was] to clean it and relight it”. It is striking not only how frequently programmes have proceeded on artistically/art-historically injurious premises, but also how very contrary the aims of those various programmes can be. Where at Chartres cathedral attempt is being made to replicate a far-distant hypothesized original decorative scheme, at St Paul’s Cathedral, London, as Florence Hallett established, a major project to transform an interior was made on a reverse (and equally perverse) artistic/historical agenda. At St Paul’s, with a much more modern documented and visually recorded building, a programme was implemented to expunge the last traces of the original architect’s initial (and easily replicable) decorative programme with aesthetically falsifying – and, in the event, health-threatening – consequences even though the originally applied tinted oil paint was a known quantity, having survived intact in protected places. 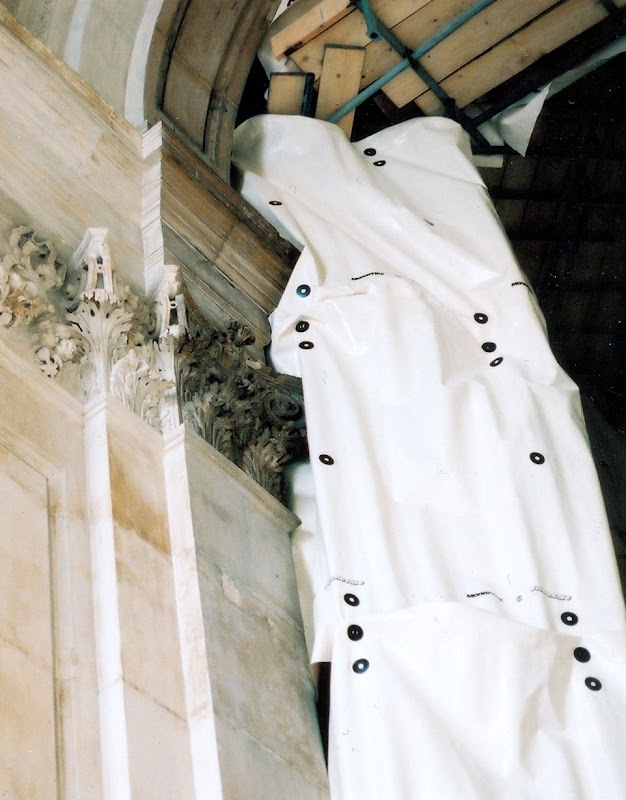 In London too, much money was quickly raised but here it was spent stripping an interior down (with chemically-invasive materials never before used inside an occupied, still functioning cathedral) to create an a-historical modernist whiteness rather than to retain surviving traces or fully replicate the known original historic surface decoration. 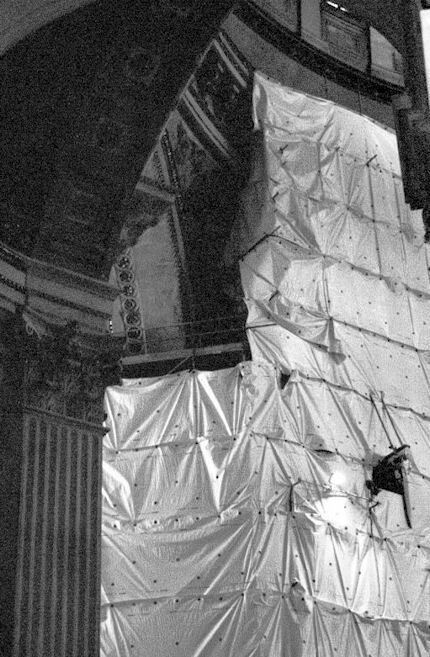 In consequence, not only has a powdery surface of stripped-down raw stone been exposed, but an already misleading appearance was subjected to the very greatly amplified artificial lighting that is shown above and was first established by Florence Hallett’s investigations: “Cleaning St. Paul’s Cathedral”, ArtWatch UK Journal 17, Winter, 2002; and “The supposedly ‘model’ restoration of St. Paul’s Cathedral”, ArtWatch UK Journal 18, Spring/summer 2003. 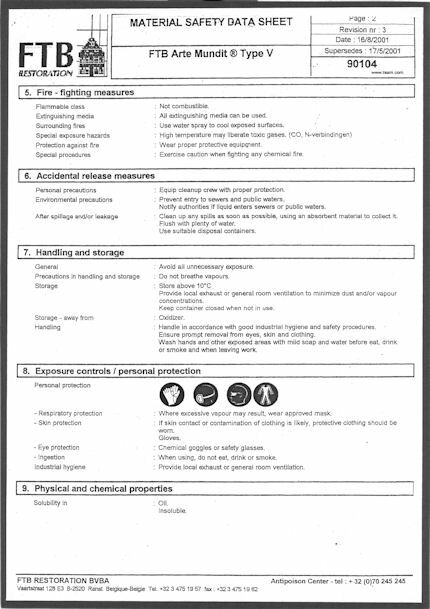 Online, see Michael Daley: “Brighter than Right, Part 1: A Modernist Makeover at St Paul’s Cathedral” (1 June 2011) and “Brighter than Right, Part 2: Technical Problems of Protection, Health and Safety at St Paul’s Cathedral” (5 July 2011). Above, Figs. 6 and 7: Top, the blotchy appearance of the stripped-down stone surfaces. Above, a simple, quick demonstration of the present dangerously powdery surfaces. 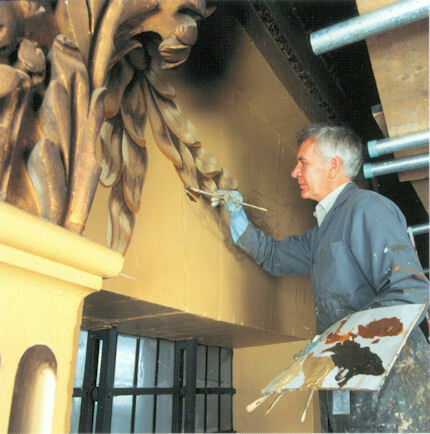 The brightness of this “restoration” was achieved at great aesthetic and material cost. 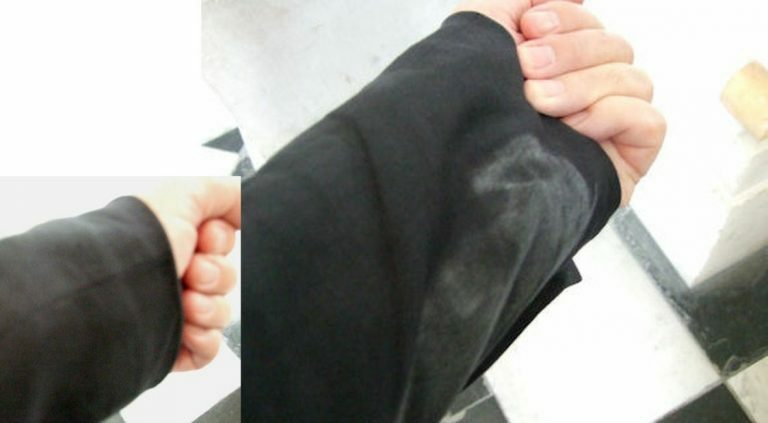 As shown above, the surfaces have been left without patina and remain disfiguringly blotchy even after cosmetic attempts to mitigate the grosser consequences of the standardised indiscriminate cleaning method (see below). 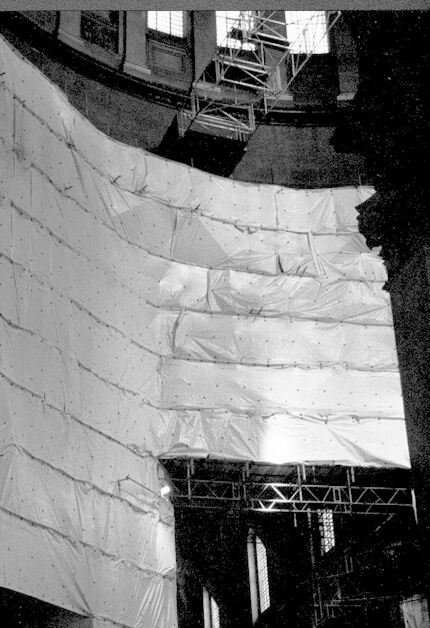 As for the supposed “conservation” purposes of this multi-million pounds programme, the interior’s now powdery surfaces are more vulnerable to environmental pollution and fluctuations of temperature and humidity than at any time in the building’s history. 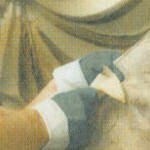 That the originally oil-paint protected surface of this limestone has been left as powdery as chalk was easily demonstrated by brushing the above sleeve against it. 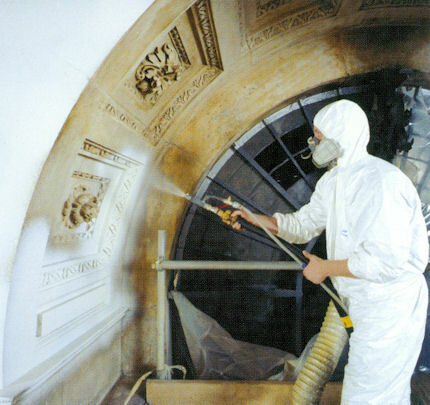 Approval for the use of an experimental cleaning method on the interior of a publicly occupied and in-service cathedral had been given by The Cathedrals Fabric Commission for England in November 1999 following (claimed) earlier approvals by a bevy of heritage watchdogs: English Heritage; SPAB (The Society for the Protection of Ancient Buildings); The Victorian Society; and The Georgian Group. 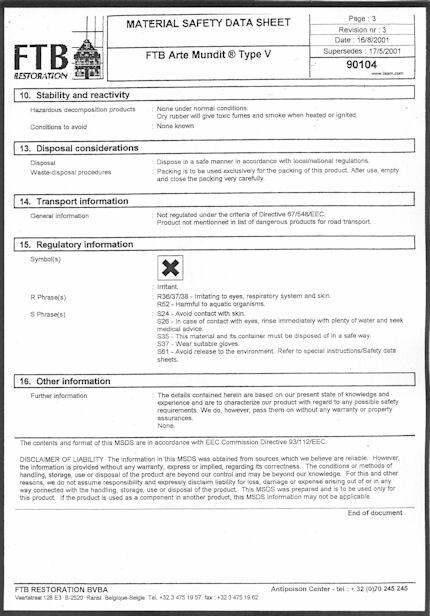 It is not possible to establish the precise chemical basis on which formal approval was given by the Cathedrals Fabric Commission for England because, in breach of good conservation practices, the three technical parts of the eight part submission document were withheld on grounds of commercial confidentiality. 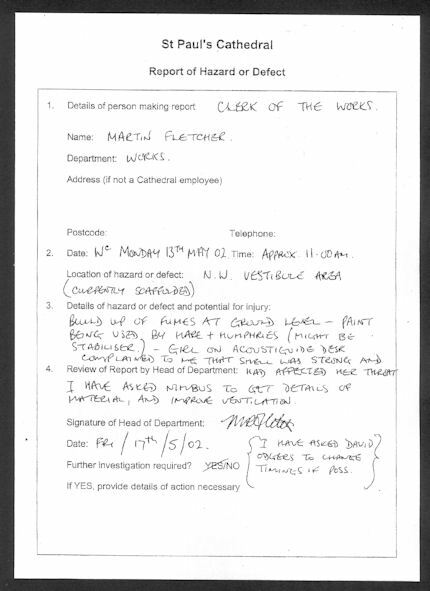 For information on technical matters we had to rely on the cathedral’s own fluctuating (and often self-contradicting) accounts; on our correspondence with the 17th Surveyor to the Fabric, which he terminated in March 2003; and on documents obtained by cathedral employees whose health was adversely affected by the restoration. 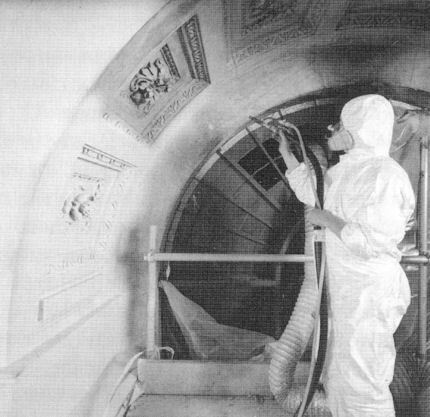 The cleaning agent used on St Paul’s interior was an experimental, technically undisclosed, adaptation of a commercial product. In both its composition and effects, it earned censure from leading conservation experts (see below). 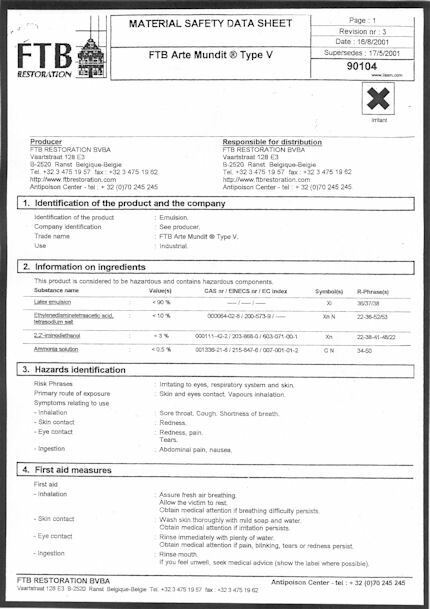 It was a commercially available, latex rubber poultice laced with a mix of chemicals that were said to comprise an agent specifically tailored to be similar to the mild alkalinity of St. Paul’s Portland stone – that is, it was a special version of the “Arte Mundit” water-based paste manufactured by the Belgian company FTB Restoration. 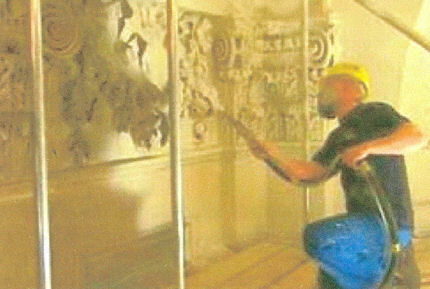 The instigator/director of the restoration, the architect and the 17th Surveyor to the Fabric at St Paul’s Cathedral, admitted (at a lecture on October 21st 2003) to having slim knowledge of matters chemical and of having devolved – “entrusted” – responsibility for the application of the new paste to the conservators of the firm Nimbus who themselves were learning on the job while the cathedral remained in full commercial and ecclesiastical use. Even now, it is not too late to save an unmolested portion of this cathedral for future generations who would otherwise never be aware of the loss and adulteration: a petition – and an invitation to comment – beckons at a touch.